CloudScan is a new, simple way to scan your documents, pictures or photos and save them to PDF file. It can be successfully used on one computer. The simple, friendly interface provides results in seconds. 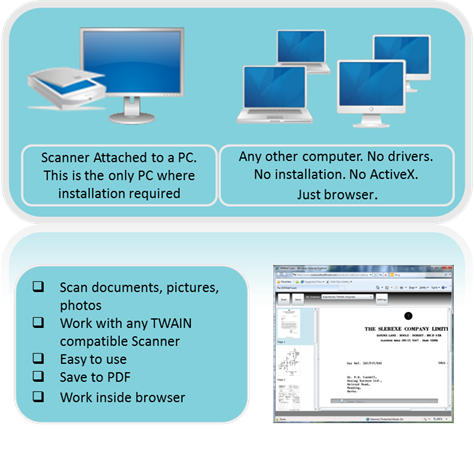 If you have more than one PC (home or office network), you are getting a revolutionary approach to scanning: just install the SharedScanner component to one PC, and you can use the scanner from almost any other computer without installation. CloudScan is new way to scan documents,pictures or photos,save save them to PDF. ...... Just a usual web browser is required. - Very easy to use. One click to scan, one more to save a PDF. You need a document from a webpage. Just click the 'install' button on our download page, then click 'can' on a new browser window. That's all, you have your document scanned. You don't scan regularly, but you still need to install and setup a scanner on each of your machines. You can avoid this - install CloudScan once, and use everywhere. Qweas is providing links to CloudScan 3.0 as a courtesy, and makes no representations regarding CloudScan or any other applications or any information related thereto. Any questions, complaints or claims regarding this application CloudScan 3.0 must be directed to the appropriate software vendor. You may click the publisher link of CloudScan on the top of this page to get more details about the vendor.